Aki over on Minted Strawberry has a simple wire work pearl stud earrings tutorial which showcases the gemstones in lovely curves. She is right when she says you don't have to use pearls but any gemstone or other beads you like. You can also graduate the sizes. The wire work is akin to two needle bead work where the wire ends pass through each bead in opposite directions. She probably used 24 G wire. 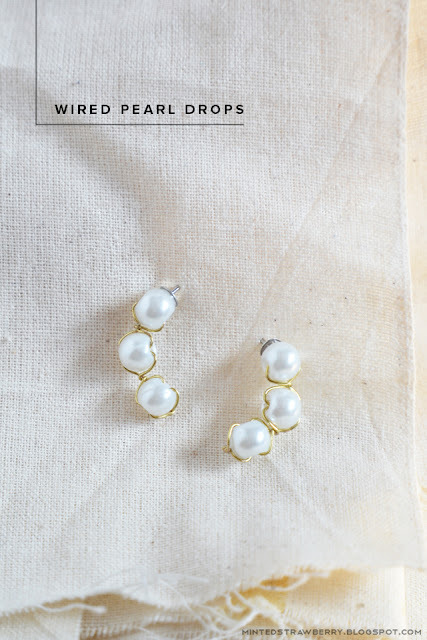 If your pearls have too small holes, you can ream them with very small round files. I would certainly choose to finish the wire ends differently in this manner - twist the wire lengths together after the last bead as she does. But instead for cutting off the wire ends here, I would lead the wire up to the gap between the last two pearls and wrap them there before trimming.